I wish I were a photographer. I would take my waterproof camera out on the stormy night, and lie down on the green field. I would aim the camera lens to the sky, and photograph the falling rain against the pitch dark tornado sky in the background. And no one would know what brought me to capture that photo. But I am no photographer. I am a storyteller. A very manic storyteller. The night I had a bad hysteria was the night a severe storm was passing through the town. The dry sky started roaring and thundering trying to give warnings about what is to come. Something was brewing up there in the sky, but it was nothing compared to what was brewing in my own head. Lightening and thunder amongst the heavy wind and stormy rain, the invisible misery casting down, striking my core, striking my control. And just like that, I have lost it. I jumped out, threw myself out the balcony door-good thing I live on the ground level- and ran as fast as I could. I was screaming, louder than the roaring sound of the thunder. My head was about to explode, and it hurt too much. I’ve always wondered why this mental pain is never enough to kill me right there and then when it feels like it should. It is strong enough to destroy me. I collapsed, feeling so spent and drained, and landed flat on my back. Somewhere on the tall grassy field, there I was lying on my back, my chest rising up and down violently. And the raindrops kept falling on my face. They hurt my skin. It was falling on me with such intensity. And right at that moment, I wished I had a camera to capture the darkness I saw in that moment. But would that one picture be enough to reveal the depth of the sadness I was feeling at that solitary second? Within that second was the dying wish of my egoistic mind. The rain drops were landing on my face like a million bombs going off all at once, all over the place, but I could also feel how much my soul wanted to recover, to be renewed, and to live again… I felt its high hopes and dreams. And then, I slowly got up after awhile, feeling so sorry to the inner being inside me. On my shameful walk back home, I wished that I had a waterproof camera. I wished that I were a photographer. I wished that they hadn’t cancelled the mental illness group meeting that night. Or I would have been at the meeting discussing about the mental illness rather than going through it. But the stormy night was upon us all, and the meeting had to be cancelled. How ironic. After the storm, I was blessed with a couple of peaceful days. While I was recovering from my downfall, I had finally purchased my new-used-car, I received one more artist to display the works at my gallery and I have taught a very successful yoga class. Life continued on. I did not stay fallen. 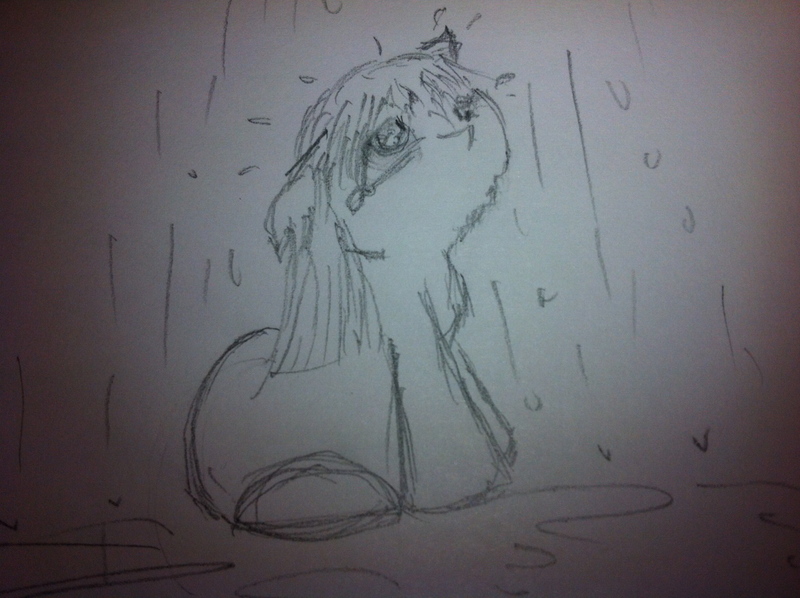 This morning I drew a sad puppy in the rain. That’s all I was, just a sad little puppy sitting in the rain. Feeling abandoned, left alone, confused, and a little out of place, in the wrong place, at the wrong time. That was all there was. I sniffed at my drawing, at my episode on that dark stormy night. Silly me. But I thought I was going to die at that very moment. I really did. But it’s all behind now, the moment has passed and gone, and here I am peacefully drawing a sad puppy in the rain on this beautiful Sunday morning. And today, it is going to be a beautiful day inside my head and out.